Born in Ukraine on 16 April 1908, he came to Manitoba with his parents Nathan Freedman and Ada Foxman, brother of Max Freedman, at the age of three and was educated at Aberdeen School, St. John’s Technical High School, and the University of Manitoba, graduating in honours classics in 1929, when he entered University of Manitoba Law School. He articled with Steinkopf and Lawrence. As a law student and afterwards he was an accomplished debater, winning the McGoun Cup in 1930 with W. L. Morton as his partner. Upon graduation, he took up work in the law firm headed by Max Steinkopf, and in 1945, was named King’s Counsel. In 1946, Freedman set up his own law firm, Freedman and Golden. He served four years as editor of the Manitoba Bar News and was President of the Manitoba Bar Association from 1951 to 1952. He served as a Bencher for the Law Society of Manitoba from 1949 to 1952. He was appointed to the Court of King’s Bench in 1952 and elevated to the Manitoba Court of Appeal in 1960. 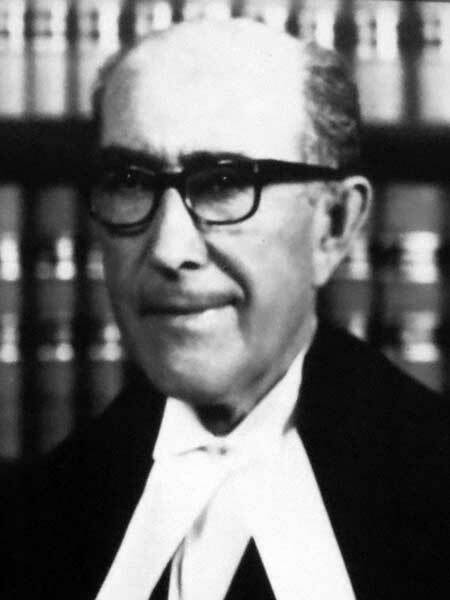 He was Acting Chief Justice (1966-1967) and became Chief Justice in 1971, retiring in 1983. He served as Chairman of a commission investigating railroad labour troubles in 1964-1965. Outside his work in law, Freedman was active in the Jewish community and in the wider Winnipeg community, becoming President of the YMHA, an active member of B’nai B’rith and Chairman of the Canadian Friends of the Hebrew University. In 1955, Freedman became a member of the Board of Governors at the University of Manitoba, and from 1959 to 1968, served as Chancellor of the university. In 1978, Freedman was awarded with a chair in legal advocacy at the law school at the Hebrew University. He was inducted into the Manitoba Order of the Buffalo Hunt in 1968, the Order of Canada in 1984, and the Winnipeg Citizens Hall of Fame in 1987. He received the Centennial Medal of Honour from the Manitoba Historical Society in 1970, the Manitoba Golden Boy Award, the Queen Elizabeth II Silver Jubilee Medal (1977), and was awarded honorary doctorates by the University of Manitoba (1968) and the University of Winnipeg (1983). He died at Winnipeg in 1993 and is commemorated by Freedman Crescent at the University of Manitoba. There are papers at the Archives of Manitoba. The Worst of Times, The Best of Times: Growing Up in Winnipeg’s North End by Harry Gutkin, Markham, Ontario: Fitzhenry and Whiteside, 1987. “Six Manitoba barristers appointed King’s Counsel,” Winnipeg Free Press, 1 January 1945, page 1. We thank Robert Clarke for providing additional information used here.